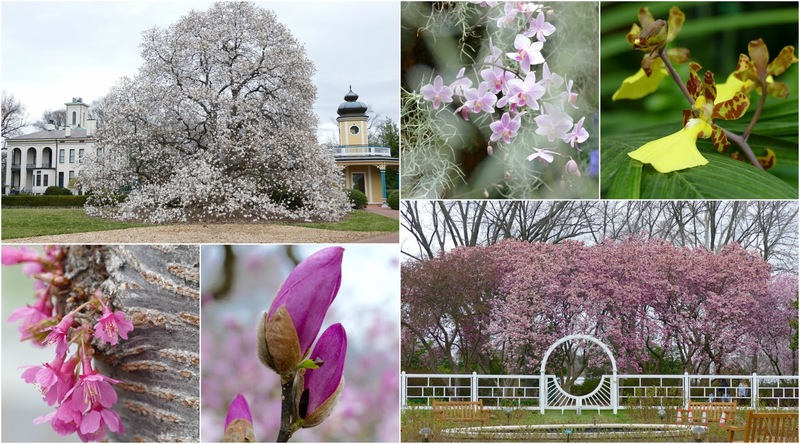 Last week I went to the Missouri Botanical Garden to see what impact our crazy spring weather has had on the plants that were coerced into blooming before their time. Sure enough, the freeze that followed the record-breaking warm days took their toll on some of the early bloomers. 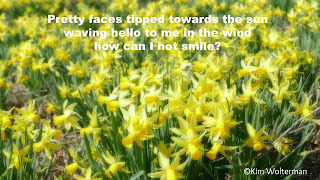 Normally the cherry blossoms are a sight to behold, but the cherry is off the bloom, so to speak. Some of the other perennials are doing okay, though, and it will be interesting to see what other plants have been affected as the season springs ahead. The day I went, the temperature was in the 70's and the garden was overrun with spring-breakers and school buses. It wasn't quite the peaceful experience I have come to expect when I visit. The high winds added a degree of difficulty to my photography, but I managed to get off several shots that I was happy with in the end. Today Jim and I met with an attorney to draw up a new will. Our original document was done in 1987, and I am pretty sure that no one would be able to find the executor should we both die at the same time. We are planning an epic adventure together, so we want this to be done before we head out. One good thing that came out of the review process was that I found out that my big life insurance policy still has my older brother named as the contingent beneficiary. So if Jim and I both die, my brother would get the money. Whoops! It made sense when I first took out the policy as my brother and his wife were going to be guardians of the children in case something happened to the two of us. It makes no sense now. I sent off a change of beneficiary form to the insurance company right away. Too bad, bro! The most impressive part of pulling together all of the various forms and documents that the attorney requested is that I actually found the Deed of Trust on our house. From 1987! I deserve a prize or something, I think. Not to mention the $$$ I saved us, as the attorney would have sent someone to the county recorder of deeds office to get a copy had I not produced the original. Having spent more hours than I care to recall digging through deeds there while researching houses, I was happy to save everyone a trip. If all goes according to plan, we will have a new will before we are on our way. 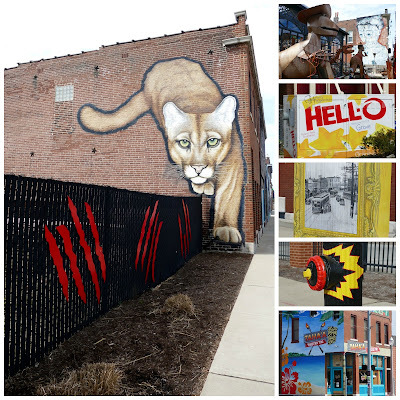 St. Louis is blessed with many unique, beautiful, quirky and fun communities. It is amazing how few of them I have really seen. But I crossed one of them off the list when I visited The Grove yesterday with a photographer friend. The district is located between Kingshighway and Vandeventer along Manchester Road, and a Sunday morning was the perfect time to do some exploring without a lot of cars and/or people to get in the way. The first thing that caught our eye was Demo Man, which is located at the intersection of Vandeventer and Chouteau. 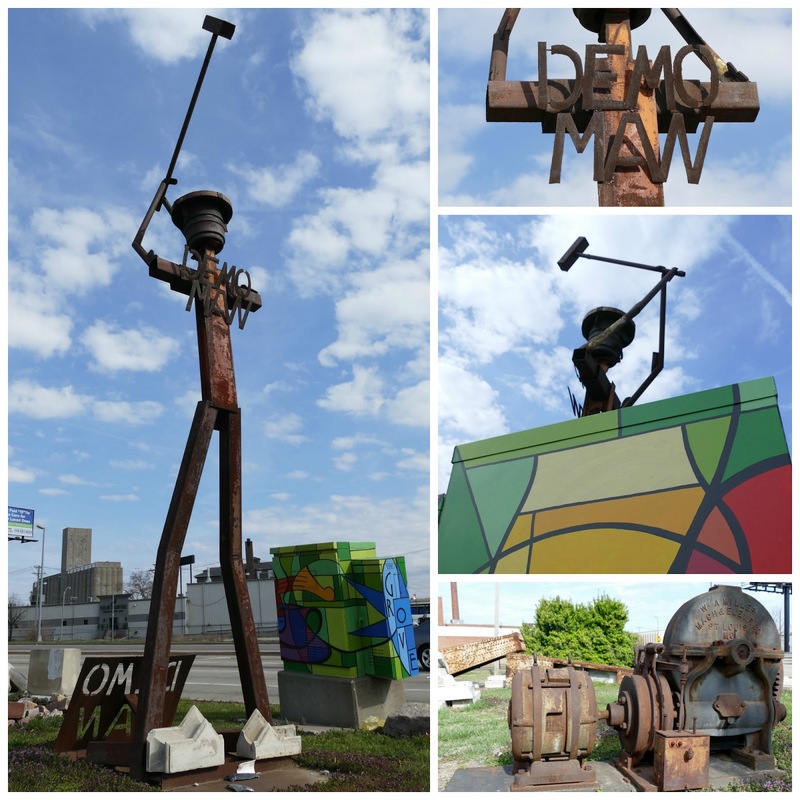 Since 2002 the 20' Demo Man sculpture has been overlooking the intersection of Chouteau and Vandeventer. The small parcel of land is owned by Don Bellon of Bellon Wrecking and Salvage. One of his employees created the piece, replicating a small statue that has been on Bellon's desk since 1973 when he started his business. 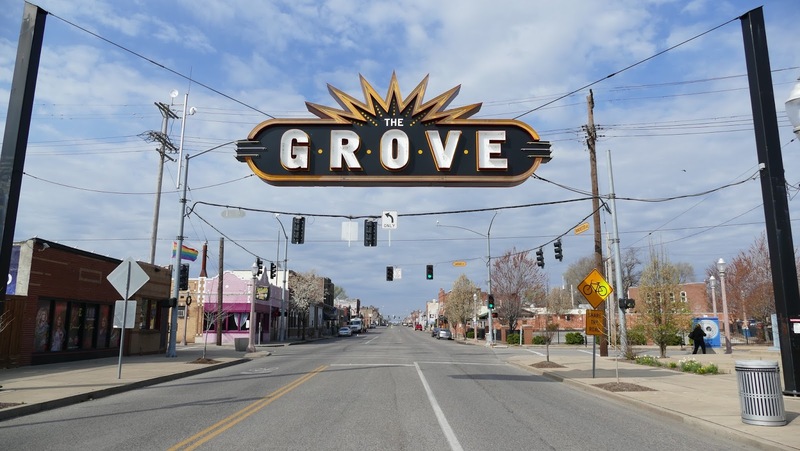 From Demo Man you can see the iconic The Grove sign, which was lit for the first time on December 17, 2010, announcing the entrance to The Grove. A second sign hangs at the east entrance near Kingshighway. The area takes up about a mile along both sides of Manchester Road. Originally a commercial district called Adam's Grove in the 1950s, the area fell into urban decline. New businesses began to open in the 1980s, and since then the area has been successfully revitalized. 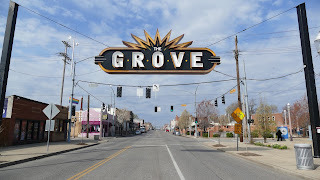 With new branding, it is now known as The Grove. The architecture in the area reminds me a bit of The Loop in University City. The vast majority of the storefronts are full - I did not see many vacancies, which is wonderful. But it is the number of public art pieces, primarily murals worked on by local artist Grace McCammond, which really capture your eye and give life to the area. Painted fireplugs and electric boxes, as well as bright splashes of trim on building exteriors, add to the colorful atmosphere. The Grove is definitely a photographer's dream, and my friend and I enjoyed living it for the morning! The old idiom is that March comes in like a lion, and goes out like a lamb. That has not been the case this year, with the temperature hitting 74 degrees last Saturday. We have already been under tornado watches/warnings twice in the past couple of weeks. The warm temperatures have thrown the trees, shrubs and flowers for a loop, with many blooming at least a month early. 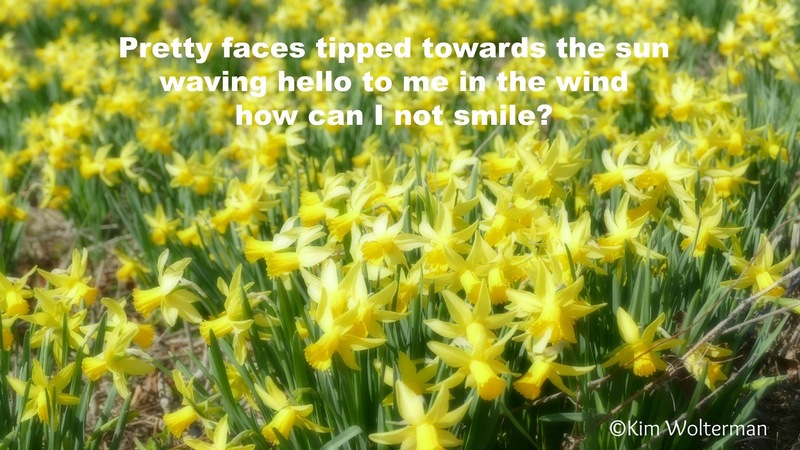 There is always the concern that a cold snap will nip the blooms in the bud. With that in mind, I went to Shaw Nature Reserve on Saturday expecting to see an array of color. Other than a field of daffodils, mother nature was keeping her buds close to her chest in the reserve. No matter, it is always a beautiful place to take a walk. 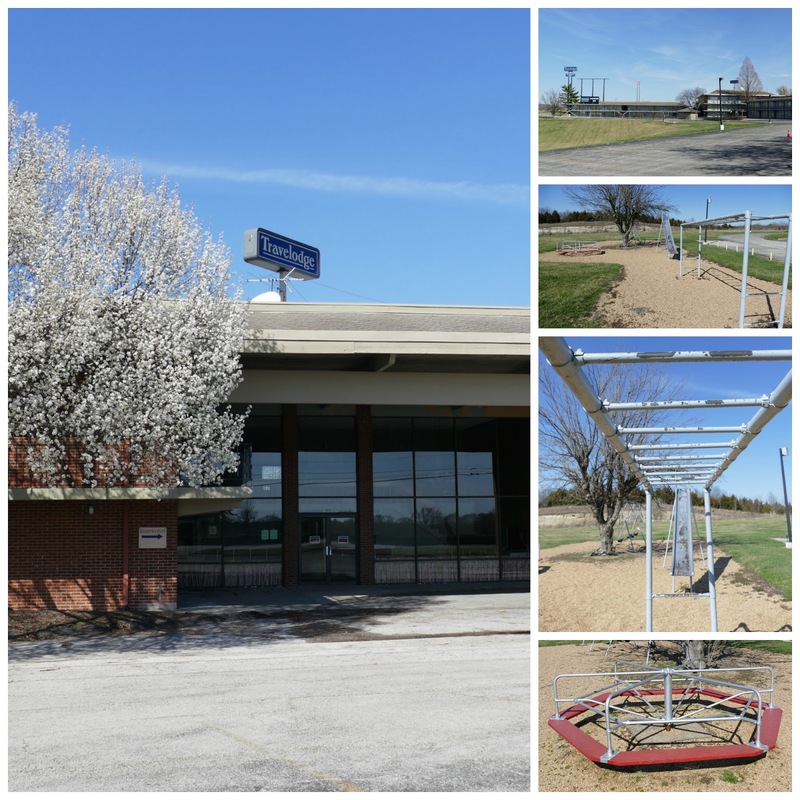 Across the street from the entrance to the reserve is a Travelodge. 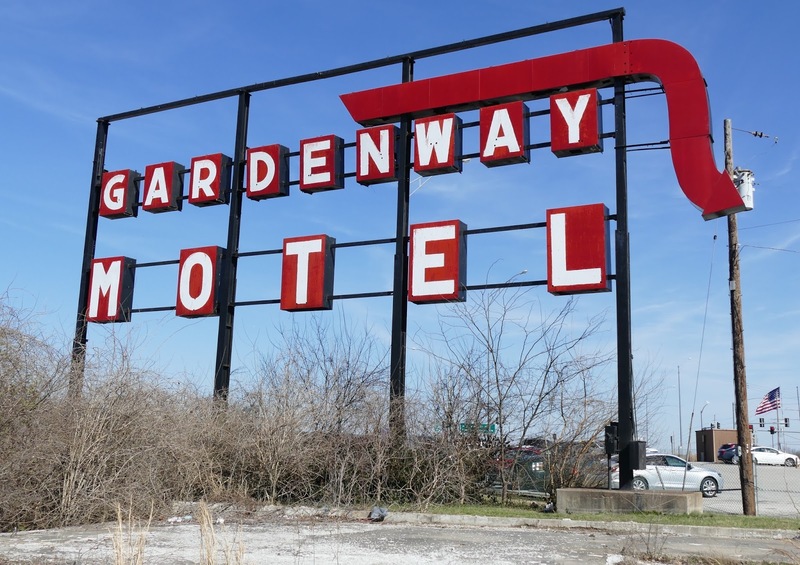 I have always wanted to stop and shoot the old Gardenway Motel sign, so I pulled into the parking lot of the Travelodge to take the picture. I had no idea the size of this closed Travelodge! All I could think was how many homeless people or veterans it could house. 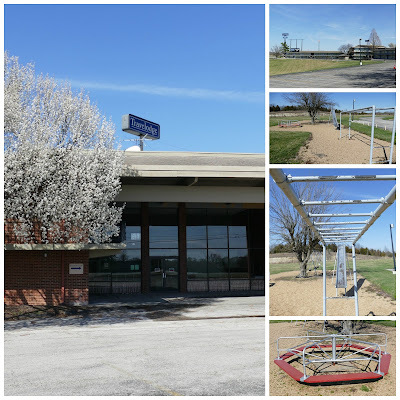 As I drove around the back, I was surprised to see a miniature golf course, two swimming pools and an old-school playground. How many little hands got blisters from crossing the monkey bars? How many butts got burned going down the metal slide? How many scraped knees from the merry-go-round? What a nice little facility it must have once been, and the close proximity to Six Flags must have been of some advantage once upon a time. Sunday was not quite as nice as Saturday, but Jim and I headed off to the Missouri Botanical Garden in the morning. He had not yet seen the Orchid Exhibit. What we didn't know is that it was corporate partners day, and they all got in for free. I have never seen so many people at the garden, except for special festivals. And we arrived early! It was packed inside the Orchid Show, so we'll need to go back when we won't get jostled every time we turn around. Thankfully, out in the garden itself it was not so crowded. The colors are really popping here! 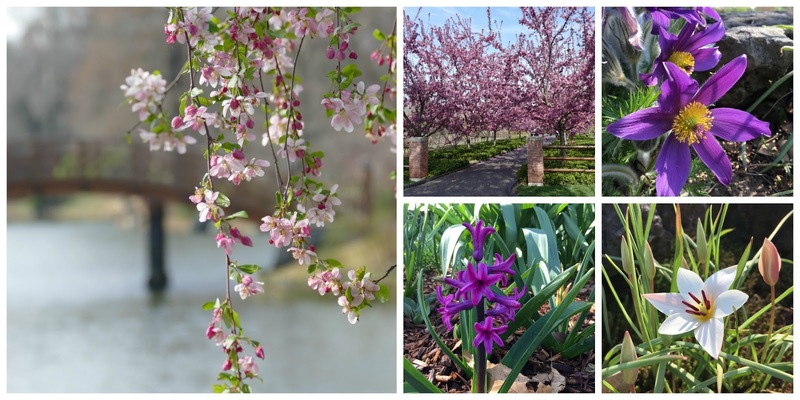 Every day at the garden is a good day, and we love to spend our time together walking and taking pictures. We are so blessed to have such an incredible facility here in our city.